When looking back at the various franchises that have seen revivals in recent years, SCREAM may not have been one that stood out for the sequel treatment, a treatment that is becoming all-too familiar. Having previously left us with the less than critically successful SCREAM 3, WES CRAVEN’S slasher series had quickly “become what it originally spoofed” (Rotten Tomatoes, 2011), a somewhat disappointing ending to what was once a fresh and entertaining idea. Despite this, it’s never too late for a sequel in Hollywood, and so Ghostface has returned in SCREAM 4. Revisiting Woodsboro after 10 years, NEVE CAMPBELL’S SID must once again face the terrors of the masked killer. Also returning to the fray is series composer MARCO BELTRAMI. 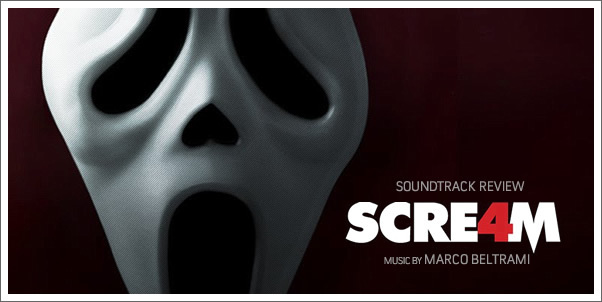 Having composed all three previous SCREAM films, BELTRAMI’S name suggests a continuation to the relatively adequate music heard previously. Never did the music of the franchise threaten to stun the ears of listeners, but it provided sufficient thrills to support the murderous efforts of Ghostface.